Each industry develops its own terminology over time, creating certain terms and a specific language which aren’t always self-explanatory. This can be a major challenge for a newcomer to a market or industry, especially when they come across terms and acronyms that don’t make any sense. The cryptocurrency sector is no exception. Knowing all the terms and acronyms can be a really tricky endeavor, especially in the hyper-complex realm of crypto affiliate marketing. Even though this industry is relatively new, operators in this space have developed a widely-accepted terminology to define the functionality of cryptocurrency exchanges and blockchain technology. To describe everyday events and situations within the industry. Are you ready for Mobidea Academy’s cryptocurrency glossary of terms? Are you prepared to get to know cryptocurrency trading terms and some basic cryptocurrency terms no human being can live without? Some cool cryptocurrency terms coming your way! Prepared for this list of cryptocurrency terms and their meanings? Here’s a comprehensive list of the most common cryptocurrency terms and acronyms! Addresses consist of between 26 and 35 characters and represent a unique wallet ID on the blockchain, much like an account number. They’re used when conducting transactions on the network, including the receipt, remittance, and storage of cryptocurrency. This usually refers to any cryptocurrency coin other than Bitcoin, which was the original cryptocurrency. There are over 1,000 other cryptocurrencies in the market. This is the name given to an investor who’s left holding cryptocurrency after it has dropped in price. These are packages of permanently-recorded data on the blockchain network. This is a distributed ledger secured using cryptography. It’s a database that’s accessible for everyone to read. Even so, data can only be changed by ledger owners. Data isn’t stored on a centralized server, but is instead shared by thousands of computers around the globe. Cold storage refers to storing cryptocurrency away from the web in a wallet or another storage mechanism to increase security. This is in contrast with a hot wallet which is connected to the internet and used for day-to-day transactions. When a transaction has been verified by miners and added to the blockchain, it receives a confirmation. Consensus is reached when all network participants approve the validity of the transactions by ensuring that ledgers are exact copies of one another. This is a type of digital asset used as a medium of exchange in business transactions. 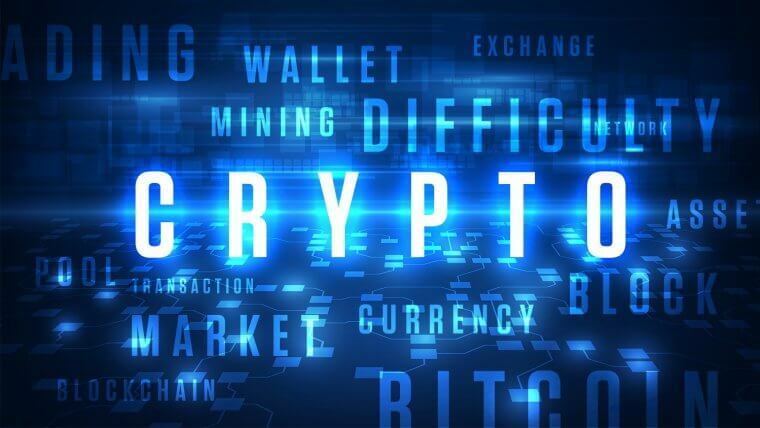 Cryptography is used to maintain the security of transactions and control the creation of additional currency coins or tokens. Not all cryptocurrencies trade as coins or currencies. If they are digital stores of value, they are termed digital assets. These can be freely exchanged or not. A fiat currency is any currency that’s issued by a government or a central bank, such as the dollar. This term applies to a blockchain that’s split into two separate chains, normally to accommodate new governance rules. This describes the very first block in any blockchain. These terms describe a margin trade that profits when the price either increases or decreases. Bitcoins have a finite supply which limits the number of coins issued to 21 million. The number of Bitcoins generated decreases by 50 percent every four years, a process that’s known as halving. The final halving will occur in 2140. This transforms a large amount of data into a fixed-length hash, or string of characters for a cryptographic key. Hash algorithms are central to blockchain and cryptocurrency transactions. This refers to the speed at which a piece of hardware can decrypt hashes. This is the basis of cryptocurrency mining. A hot wallet is connected to the internet and used to hold cryptocurrency for everyday transactions. Because of the increased security risk over a cold wallet, a hot wallet should not store large amounts of currency. Investors who set incremental buy or sell orders are said to be laddering. Cryptocurrencies aren’t printed like traditional currencies – they are mined. This process uses computer hardware to solve complex mathematical problems and decrypt hashes. Miners are rewarded for their work with cryptocurrency coins. Cryptocurrency mining requires a huge amount of power. Mining rigs consist of multiple graphic processors (GPUs) to increase processing power. When a cryptocurrency coin goes on a market run and drives the price up quickly, it’s referred to as mooning. This refers to a situation where multiple signatures are required to authorize a transaction. This increases the security of cryptocurrency transactions and reduces the risk of theft. A blockchain isn’t stored in a central location. In fact, it’s distributed to any number of computers – called nodes – which host it. Each node is instrumental in verifying the ledger within the blockchain. This is the key – or password – which unlocks a wallet. It shouldn’t be shared with anyone. A public key is a wallet address that can be shared with other parties to effect transactions. This is a form of market manipulation by traders who artificially inflate prices and then exit the market, thus causing a collapse in the price. Sharding is a scaling method that enables nodes to keep partial copies of blockchains. This can improve network performance and increase consensus speeds. A smart contract contains encoded rules governing business transactions. It’s created in a programmable language for storage on the blockchain and it’s enforced by network participants. Spoofing occurs when investors with large holdings trade with themselves to create the illusion of volume. Market or price volatility refers to the movement in the price of a cryptocurrency over time. The cryptocurrency market typically experiences wild swings between high and low prices. In the cryptocurrency sector, a wallet is a digital address used to store coins or tokens. It can be used to send and receive these items during cryptocurrency transactions. Whales are investors who hold a significant number of coins or other cryptocurrency. They can have a marked influence on market movement. The highest price that a cryptocurrency has ever reached. Decentralized applications, describing a blockchain-based application that operates entirely in a decentralized way. This is an investment technique used to reduce the impact of market volatility by spreading out buys and sells over an extended period of time. This is commonly experienced in a rising market where new investors experience the fear of missing out on gains to be made. The effect of this demand is to drive the market price higher. These emotions are common in volatile markets. This is similar to an initial public offering (IPO) in the equities market. An ICO is used by cryptocurrency startups to raise capital for their ventures. A set number of coins is offered for sale to the public in exchange for fiat or other cryptocurrencies. A lot of ICOs are actually scams! This is used to validate the creation of cryptocurrency by miners who are required to solve complex calculations. This difficulty is instituted so as to make it harder for cyber attackers to add invalid blocks to the chain. Individuals can gain rewards via a proof of stake in case they hold more currency in their wallets for a length of time. This is the profit made on an investment or transaction. This technique is used by market analysts to predict price action. These are most of the common cryptocurrency terms and acronyms used in the industry and should help to give a new investor a better understanding of the market. Since this is quite the dynamic and growing industry, it’s likely that more industry-relevant terminology will be added in the future! Pay attention to what’s coming next in the world of crypto, stay updated on the latest blockchain trends, and invest like a master who earns that sweet cash much faster! Keep coming back to this glossary of cryptocurrency terms whenever you need to brush up on cryptocurrency investment terms!